The time has again arrived for the publication of another School Magazine and I wish at the outset to congratulate both the Supervisor and the Committee for their enthusiasm and industry in making this issue possible. The last academic year was a highly successful one both from the point of view of examinations, scholarships, travel and drama. The whole of Georgetown seems to have enjoyed "Schooldays can be Fun". What with eighteen distinctions at the ( A Level and the winning of both Guiana Scholarships, the name of Queen's College has never stood higher in the country ! May I exhort the present boys to continue the good work an example set by those who left in 1965. As we eagerly await our Independence next year, it may be useful to ask, like our prime minister the honourable Mr. L. F. S. Burnham: " Whither goeth Guyana ? " We should take time off from our enthusiastic celebrations to consider this question. It is hardly likely that we shall go forward if the selfish and irresponsible attitude which precipitated disturbances in the past few years, continues after Inpependence. I think we realise this quite firmly. We hear, however, much talk of the need for patriotism and nationality. We should take care that we realise fully and accurately what this implies, before we approach it with different pre-conceived interpretations. Nationality is not based on similarity of race, religion, language, or even of commercial interests. Nor does geographical entity describe a nation. Ernest Renan, in his 'Discours et Conferences', gives an apt interpretation: " A nation is a soul, a spiritual principle ......... A nation is a great solidarity created by the sentiments of the sacrifices which have been made, and of those which one is disposed to .make in the future. It presupposes a past; but it resumes itself in the present, by a tangible fact: the consent, the clearly expressed desire to continue life in common. " This interpretation comes closest to what Nationality should mean in the context of our country. Racial, political and social divisions shall struggle to assert themselves, and only the ' common sentiments ' of nationality will be able to transcend them. Independence in itself should form enough common sentiments to facilitate Nationality. But why so much fuss about Nationality and Nationalism ? Some of us may rest satisfied to see our country being developed by a few local individuals, and the philantrophy (?') of foreign countries. But we achieve such progress only at the sacrifice of our individual and national liberty. -The very fact that we have demanded and achieved the granting of Independence shows that we are not content to be pushed around while we depend on others. It show that we are ready and willing to assert our liberties, and take the full responsibility of governing ourselves. After Independence, there shall no longer be a provident 'Fairy godmother'. We shall be made to provide for, and support ourselves. We can only do this successfully, and derive some worthwhile benefits from Independence, if we agree upon and practise "the clearly expressed desire to continue life in common". Sitting (L to R):Mr. N.K. Robinson, Miss Ivy Loncke, Mr. Moffat, Mr. E. London, Mr. N.A. 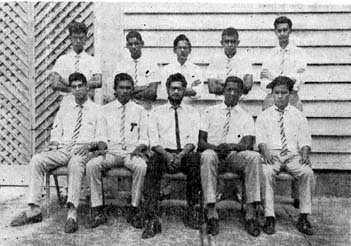 Robinson, Mr. Barker (Deputy Headmaster), Mr. D. Locke, Mr. D. Hetram (Headmaster), Mr. C. Yansen, Mr. Yhap, Mr. Glasgow, Miss A. Akai, Mr. B. Chinapen. Standing (L to R): Mr. K. Brotherson, Mr. S.M. Insanally (partly hidden), Mr. T. Thompson, Mr. J. Gopaul, Mr. Mangal, Mr. I Trotz, Mr. V.J. Ramraj, Mr. M. Barton, Mr. C.O. Perry, Mr. P Jonas, Mr. King, Mr. C. Yearwood. "The heights of great men reached and kept ...... "
Mr L. F. S. BURNHAM Q,C., on his appointment as Prime Minister of British Guiana. Mr. S. S. RAMPHAL on his appointment as Attorney-General of British Guiana. Mr, L. A. LUCKHOO Q.C., on his appointment as B.G. Commissioner in London. MR. E. V. LUCKHOO on being appointed Queen's Counsel. Mr. R. GAJRAJ on being honoured by the Queen as a Commander of the British Empire. Mr. S. E. WILSON on obtaining his L.L.M. Mr. T. A. D'ANJOU on obtaining his B.Sc. Hons. ( Bangor ). Mr. R. S. DOOBAY on obtaining his M.B., B.S., (U.WJ. - London). Mr. M. Y. BACCHUS on obtaining his M.B.. B.S., (U.W.L -London). Mr. R. R. SAHOYE on obtaining his M.B., B.S. (U.W.I.- London). Mr. K. SEWCHAND on obtaining his M.B., B.S. (U.W.I. - London). Mr. E. C. R. BREWSTER on obtaining his L.L.B. Mr. H. W. L. PAYNE. 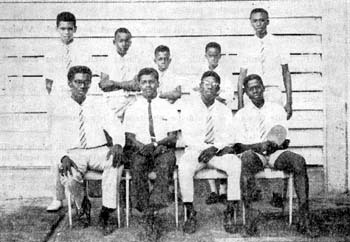 Mr. C. DENBOW on winning a 1964 Guiana Scholarship. 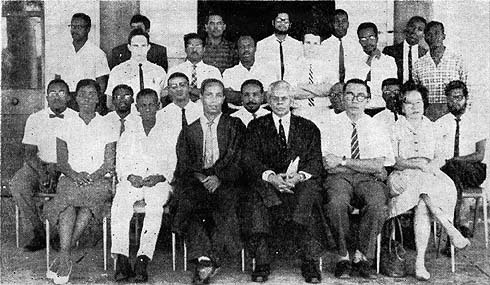 Messrs. J. L. ROBINSON and C. A. YING on winning the 1965 Guiana Scholarships. Mr. H. NIAMATALI on winning the Rhodes Scholarship. Messrs. W. L. M. STUART, J. L. CHIN, and E. C. GELOT on being granted Demba Scholarships. Mr. M. KONG, on obtaining a Sandbach Parker Scholarship. Mr. G. W. DANIELS on obtaining the United Arab Republic Scholarship. Messrs. C. B. L. MORGAN, A. ISHOOF, and D. T. ROBERTS on obtaining cadetships from the Special Service Unit. Messrs E. N. HARRIS, V. CHIN, D. BARRAN, G. B. BOURNE and C. CHOLOMONDELEY on obtaining U.S. Scholarships. Messrs. C. HO, D. N1LES B.Sc., L. RAGOBEER. J. HINDS, B. PERSAUD, W. BARRAN and J. PIGGOTT on obtaining Bookers Scholarships. Messrs M. COX, C. MARSHALL, E. DOUGLAS, N. HOLDER, G. FARNUM, H. WEST, S. SANFORD, W. LUCK. M. PATTERSON, S. YHAP, S. ALI, G. NOOTEN, A. WATKWS, T. SMITH, M. YHAP and E. HOPKINSON on being awarded B.G. Government Conditional Scholarships. Sitting: D.A. Morrison, J. Went, Mr. McDonald (Supervisor), A. Fox, R. Arthur. Standing: A. Paul, B. Johnson, C. Campbell, I. Crawford, A. Morrison. Sitting: (L to R): B. Moore, S. Bacchus, Mr. E.W. London (Supervisor), R. Cambridge (Captn. ), M. Khan. 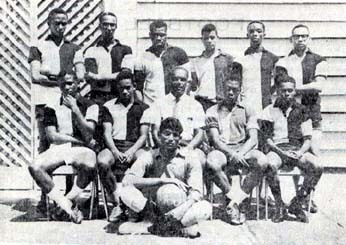 Standing (L to R): G. Robinson, N. Ng-A-Qui, P. Alexander, C. Kirton, P. Walcott, C. Jobe, A. Morrison. In front: (L to R): K. Narine. 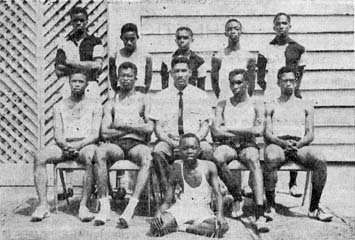 Sitting: (L to R): K. Henderson, B. Johnson, S.E. Moore (Coach), W.G. Evans, E.A. Persico. Standing (L to R): A. Morison, R. Dummett, H. West, J. Cumberbatch, I. Crawford, N. Ng-A-Qui. Sitting: (L to R): N. Jabour, E.B. Azeez, Mr. V.J. Ramraj (Supervisor, W. Blair, B. Cyril. Standing (L to R): T. Akai, E. Changley, Z. Oswald, J. Nunes-de Souza, H. Harriprashad. Sitting:N.S. Persaud, Mr. Glasgow (Supervisor), P. Walcott, D. Critchlow. Standing: C. Hopkinson, L.C. Clarke, J. Benfield, Bourne, B. Moore. --------------------- (Eight Cricketers) – Charles Cambridge 16, Richard Cambridge 18 (Capt.) Mushtaq Khan 18, Clairmont Kirton 17, Terry Martindale 14, Andy Morrison 15, Nippy Ng-A-Qui 18, George Robinson 17. (Six Footballers) – Ivor Crawford 19, Johnny Cumberbatch 18, Ronnie Dummett 18 (Capt. ), Winston Evans 18, Kenrick Henderson 16, Kenneth Narine 18. (Five Atheletes) – Roger Arthur 19, Allan Fox 19 (Capt. ), Ian McDavid 16, Astill Paul 18, John Went 18. Remaining Members: Morty London 14, Ksishnadat Mahesh 16, Brian Moore 17, Senior Master Mr. London, Games Master Mr. Jonas. Duration: Two weeks – Wednesday 4th to Tuesday 17th August, 1965. Athletics: Q.C. : 50 points - Q.R.C. : 84 points. Cricket: (First Match) Q.C. : 87 and 111 – Q.R.C. : 143 and 90. (Second Match) Q.C. : 0 – Q.R.C. : 3. Tours of British petroleum and Texaco. Lost a combined match versus B.P. 1 – 3 and drew with Texaco 0 – 0. Had three free days to travel around the country and go to church, this latter being optional. Remarks: the lads had such a wonderful time off the field that one might with some justification wonder whether this was not a contributory factor to their defeat. We believe, however, that they tried hard and they lost to a better side. It must be remembered that Queen's Royal College called upon the services of 35 of their playing members to our 19 though this is a natural restriction imposed upon any touring party. 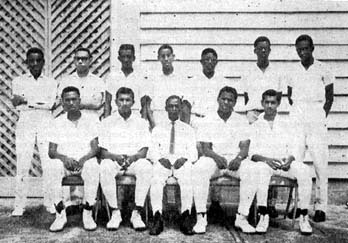 The margins of defeat were decisive enough but fairly close and special mention should be made of Richard Cambridge who was easily the most out- standing cricketer on either side; of young lan McDavid who, coupled with the elder Mottley, stole the spotlight in athletics; and of Andy Morrison, one of the youngest members of the group, who turned out to be the best all-rounder. Educationally the tour was very successful. Socially it was exciting and we could not help expressing our gratitude to those parents who billeted our boys privately. What was lost in togetherness was to our mind amply compensated for by more lasting benefits. They had a first hand insight into the Trinidad way of life. It must be noted, however, that organization could have been improved upon. In our first football match, for instance, one of our key players was twenty minutes late due to faulty arrangements in transportation. Press coverage was sympathetic, though, as was to be expected, cleverly nationalistic. Generally speaking, therefore, we remain convinced that good- will tours of a similar nature should be encouraged, and we look forward to being hosts when we shall endeavour to turn the tables on the field of play and at the same time to treat our guests royally. The village policeman first saw him. Old Rollins, making a check on the houses in his charge, saw the body under the tree; the size was what attracted his attention. The man was of immense stature; he lay on the ground, arms crossed, feet wide apart, and was stark naked. Yellow hair covered his body, and yellow slime oozed from his mouth and nostrils. Old Rollins felt the man's pulse, and feeling no beat, called the ambulance to dispose of the body. The ambulance arrived and the assistants, four in number, manhandled the body into the van. At the doctors' office where the body was laid, the villagers flocked on hearing the news, all feeling and probing at the man's body. The first sign of impending disaster was the death of Old Rollins. He was found in the gutter, slime, closely resembling that of the stranger flowed out of his nose and mouth. Next were the four assistans, all spewing out the yellow slime. When it became apparent that death followed all those who had contact, directly or indirectly with the stranger, rioting broke out, and the police forces from the neighbouring villages were called in to quell the rioting. But death was ever present; mothers, sons, daughters and fathers all fell, victims to the strangers' curse. The area was cordoned off, but already thousands of miles away, the disease had spread. Over the radio, the announcer said that rioting was going on in the capitals of the great countries of the world, then he too with a groan stopped. Another victim. In the doctor's room, the strange body lay in the bed, surrounded by scientists from all over the world trying to make serum; One by one, they fell but the rest continued until the last one with a sigh, rose and smiled thinly: Success at last. He stepped into the open. rubbed his face with his free hand, and feeling the slime, fell. Just then the stranger got up: He stared at the unfamilar surroundings expecting to see the metal frame of the space ship: He gazed at the shining instruments and the people sleeping, then he remembered. His men had mutinied he had alerted his home base Onxlym, only to have his men desert him on this inferior planet Earth. He remembered having a cold, and marvelled at its disappearance. No doubt these earth creatures were skilled medical men. He went to the door of the doctor's house, smelt the sweet sickly smell of death, but not knowing its significance, he turned on his mind's eye portrayer, thought of home and left.